At Blue Pen we are healing the lives of children, women and men living in slums and under flyover by providing them essential education, medical care, vocational training and with technology we are contributing in their all round development. In the technological era at Blue Pen we are working forward in all round development as we are making them able for puncture and mobile repairing , handling of laptops, iPads and computers. 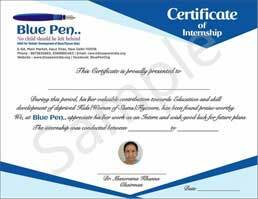 Blue Pen is helping needy children, women and men by providing them regular medical check-ups by the medical experts in addition we are teaching about Cleanliness and hygiene.